Hopefully Boston drivers have a healthy queue of podcasts to listen to because they’re spending more time locked in traffic. Congestion into and around Boston got worse in 2017, with the average driver spending 60 hours stuck in traffic during the year — two more hours than in 2016. That’s according to annual rankings released by INRIX, a firm that studies transportation data. By that measure, Boston now has the seventh-worst traffic in the country, leapfrogging past Dallas after ranking eighth in 2016. 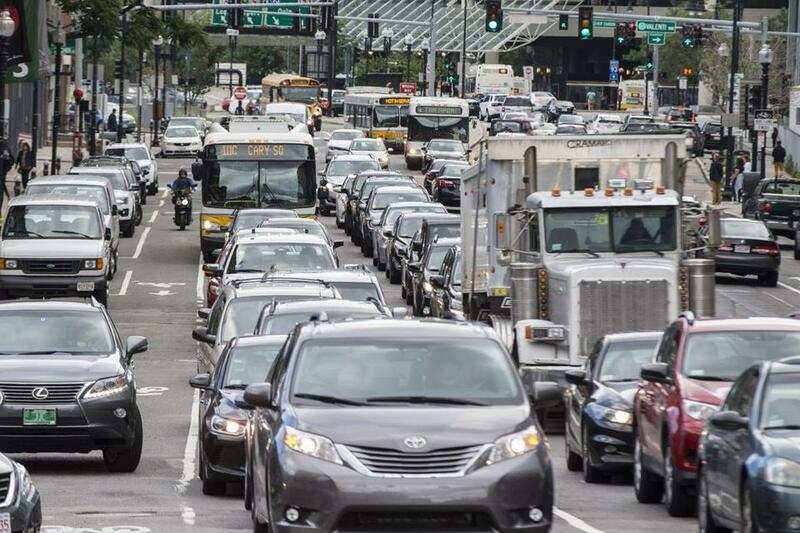 Boston drivers also spend 14 percent of their overall driving time in congested traffic, tying it for worst in the country on that measure. The study came the same week a survey from a regional planning agency suggested Uber and Lyft rides are making Boston’s gridlock worse. Los Angeles’s infamous traffic is still the worst in the country, INRIX found, with drivers spending 102 hours in traffic last year. New York ranked second, followed by San Francisco, Atlanta, Miami, and Washington, D.C.
INRIX’s data made an appearance in Boston’s bid to host Amazon’s second headquarters. The city said its 2016 rank as eighth-worst in the nation wasn’t so bad and noted that time spent in congestion had decreased by six hours, from 64 to 58, over a little more than a decade. But with things getting a little worse since, the city now probably owes Amazon a few edits on those traffic levels as it enters the next round of the headquarters sweepstakes. The “high-speed” trolley line between Mattapan and Ashmont has always been something of a misnomer. But things have been moving slower than usual of late since a late-December crash took two of the line’s 72-year-old trolleys out of service. Now just four trolleys are operating on the 2.5-mile link, meaning longer waits for passengers between trips. The T is planning to mix and match parts from the two trolleys damaged in the crash, as well as a pair of other trolleys on the disabled list because of mechanical issues, ultimately bringing two vehicles back to service. That won’t be until the summer. Meanwhile, the T will also spend nearly $8 million to repair deteriorating roofs and other equipment issues on the old Mattapan fleet. That work is expected to be completed throughout 2019 and would extend the trolleys’ life by another six years or so, MBTA Deputy General Manager Jeff Gonneville said. This all comes as the MBTA awaits the results of a study due this spring that will consider what the agency should do with the line. In the past, officials have floated the idea of replacing the fleet with new trolleys, or with buses. Standard Red Line subway cars cannot operate on the trolley line for several reasons, including the lack of an electrified third rail. Abandoning trolleys for buses would almost certainly be met with some neighborhood resistance. But even a decision to replace the existing old fleet could get some pushback. While commuters cheer plans to replace the Red and Orange line trains, the Mattapan line’s trolleys are treated with an antique reverence by some advocates and elected officials. Ah, the big transit hubs around Boston: Back Bay . . . Kendall Square . . . Lynn Waterfront? A new transit study from the business group A Better City identified Lynn and several other outlying areas as upcoming areas for economic growth in the Boston area, suggesting they will need transportation improvements to sustain the growth. Suffolk Downs, Lower Allston, and the neighborhoods surrounding Somerville’s Green Line extension are high-profile areas primed for major development and were all noted in the report. But the study also cited parts of Lynn, Waltham, Mattapan, and Malden as areas that will develop alongside transit in the coming years. ■ Redesigning commuter rail service to provide frequent trips from urban areas like Lynn or Allston, or on the Fairmount Line, as well as more regular service out to the suburbs. Some of these are already in the works. The state is exploring new ferry routes, lobbying cities to create bus-only lanes, and undertaking a long-term study on how to better use the commuter rail system.